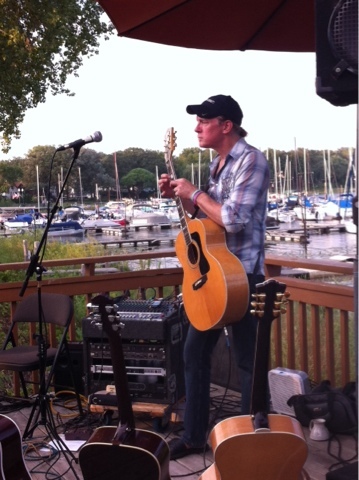 Labor Day weekend here in Minnesota is sort of the last hurrah to summer before everything is all pumpkins and apples. The weekend was all about flying high and summer breezes. My son turned 16 the end of August and, on many occasions, reminded us that he's only traveled to 3 other states in his WHOLE 16 years. Those being our surrounding neighbors Wisconsin, North Dakota and Iowa, all of which were traveled by car. This being the case and apparently not the most exciting travels for a teenager, he often would bring up the fact that he's never been up in a plane. Not only that, like so many of his friends that have flown to Mexico, Florida, Hawaii and even overseas, he's never been anywhere cool. What? You mean the World’s Largest Buffalo in North Dakota wasn't exciting enough! In order to mark this off the bucket list of a 16 year old birthday boy, Mister O thought it a fun idea to get him up in a 4 seater Cessna 172 plane for a little 1 hour tour. Granted it wasn't Hawaii, but at least it got him 2000 feet off the ground and flying. It's a start! We joined for the ride and besides it being hotter than 4 people crammed snugly into a tin can, it was a fun experience. I've only flown by jet plane, so this was an experience even for me. I checked it off my bucket list too! Unfortunately, for my son, the sky high adventure didn't escape a brief moment of being a little green around the gills. However, I think he thought the flyover our home state was pretty awesome and he got a real pilot experience. Our pilot at Anoka-Blaine Airport was fantastic and he did a great job guiding us through the aviation world for our Discovery flight. I'd recommend this option for anybody interested in wanting to be a pilot or if you just want the aviation experience. This weekend was also full of warm summer breezes on White Bear Lake. The place to be during summertime is at Tally's Dockside - check out all the links I provided for more info and pictures. 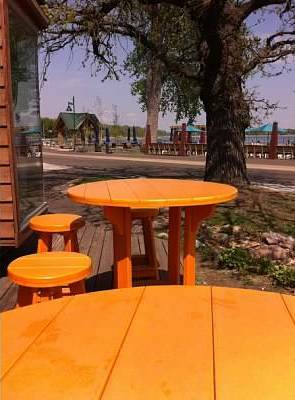 They have live weekend entertainment while you relax in an Adirondack chair enjoying the music with a great view of the lake and feeling the breeze in your face. 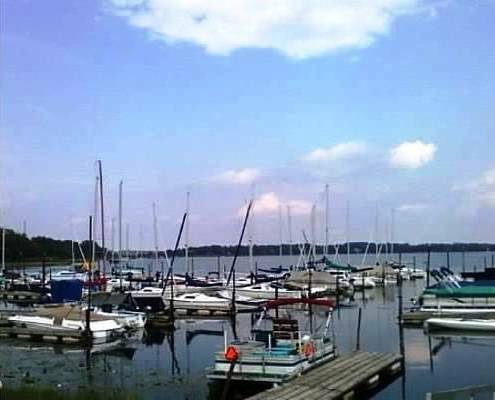 The boathouse & pub area has a vacation marina vibe with a little charm of beach paradise. Along with a full bar, you can dine out on the deck where the food is prepared across the street at CG Hooks BBQ, owned and operated by the same people. CG Hooks offers many Bar-B-Q sandwich choices, appetizers and salad choices along with a variety of fun ice cream flavors. I had the Raspberry Ham & Brie Press Sandwich. All the goodies pressed between ciabatta bread. Just loved the sweet and salty combo and the melted Brie was simply scrumptious. Mister O had the Yardbird Skins, which are potato skins filled with pulled BBQ chicken, corn salsa and cheese. They must have been good, he didn't talk much once he started eating. And, that's sayin' something! Keeping the beach and surfing theme, as you enter CG Hooks, there's a cool surfboard bar serving up draft beer and wine and then just few feet away is the ice cream shop. Wow, beer on one side and ice cream on the other. What more could you ask for! For additional summertime fun, Tally's offers rental of pontoons, boats, kayaks and paddle boards. Flying High and Summer Breezes was a great way to wrap up a Labor Day weekend in Minnesota and soon we’ll need to warm up with those Pumpkin Latte’s. What a very cool thing for your son! Yes, Haralee it was, and a cool thing for all of us to do! What a wonderful gift for your son! It is amazing to see the farm fields from 2000ft, especially as the colors are changing. White Bear Lake looks beautiful. We are always looking for beautiful places to sail- will have to check it out!